Patience is a funny thing. Apparently, if you let me remove something tasty (especially something that smells like cinnamon-y heaven) from the oven and tell me to “wait,” I think patience is overrated. 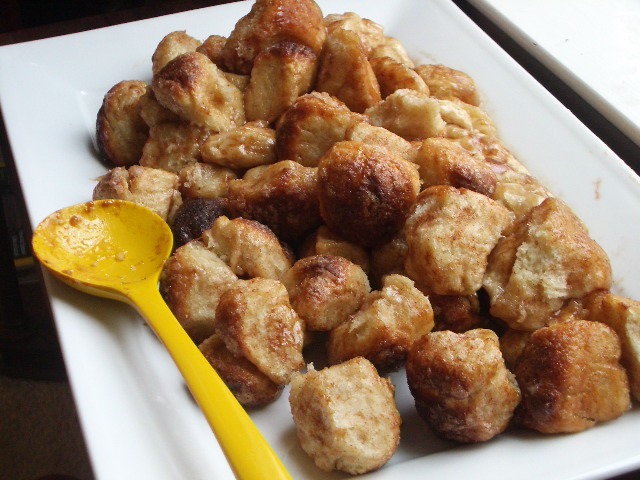 This was supposed to resemble what most people call “Monkey Bread.” You know… that bundt-shaped mound of cinnamon roll-y cake that you pull apart with your hands? 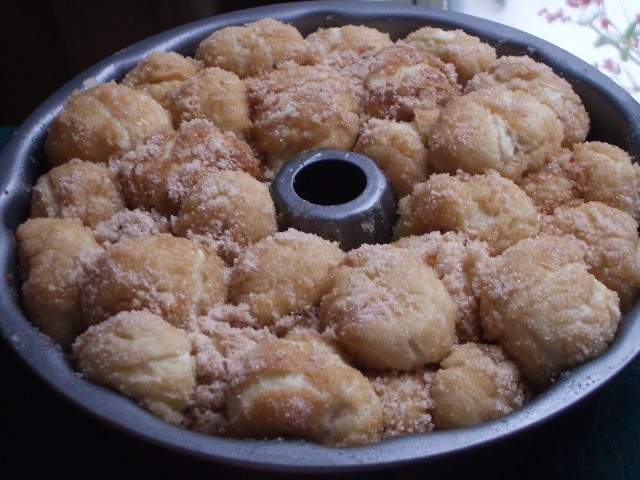 See – I did everything right… I made the little balls of dough, dipped them in melted butter, and rolled them in cinnamon sugar. Then, I piled them into a bundt pan. See? And then…. The oven went beep beep beep. I cracked the door and the most satisfying smell ever filled my nostrils. I was suddenly overcome with happiness, excitement, and hunger. And I completed ignored the recipe I’d been following. Patience IS a funny thing. It’s a good thing that sometimes, when you ignore instructions, everything still turns out perfectly. Make a note – make these for your Daddy whenever we come visit! this picture/description is torturing me at my desk. if you could please deliver some of these to me–that would be great. thank you.